GALION — Officer Basco, a Belgian Malinois, has reported for duty with the Galion Police Department’s K9 unit. His partner is Officer Tim Johnson. The team is completing the last bit of required training before beginning regular duty. 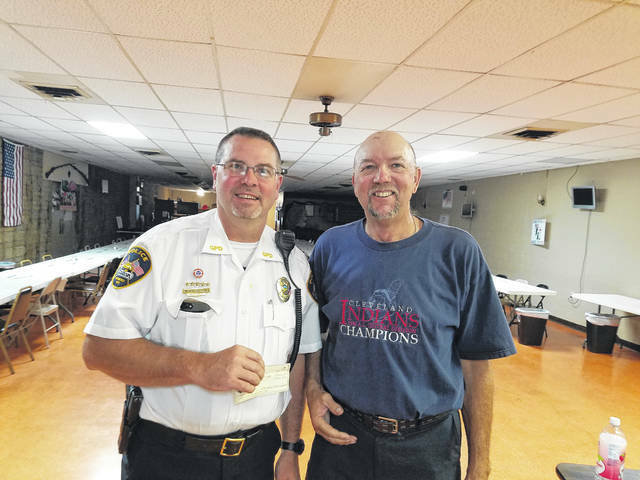 As previously reported in the Inquirer, Galion Police Chief Brian Satterfield coordinated the fundraising efforts of approximately $16,000 to form this unit, at no cost to the city. Among the contributors has been the TNT Bar, League of Riders Motorcycle Club, Galion Elks and Galion AFSCME Union. While the procurement and initial training of Basco was funded through donations, Satterfield was still approximately $3,000 shy of the target. Local Legionnaire Ken Green, finance officer of Galion American Legion Scarbrough Post 243, heard of the shortfall and contacted Chief Satterfield for more information. On Sept. 10, 2018, Green took the matter to the Galion Legion’s executive board and in less than two minutes the $3,000 was approved for disbursement to Satterfield, making Basco one happy puppy. Satterfield wished to impress on Galion residents that this upgrade in police capabilities is not intended to rely on tax dollars for support. Several thousand in additional funds each year will be needed to sustain Galion’s K9 program. These funds are required for food, veterinary care and periodic training. Many in Galion may qualify to join the Legion and assist with the post’s charity fundraising. Veterans who served during the authorized periods qualify as regular members. Sons of the American Legion and American Legion Auxiliary members generally qualify, either through children who have or are serving or through direct ancestors back to, in some cases, great grandparents who served. For more information on the Galion American Legion, call 419-468-1208.